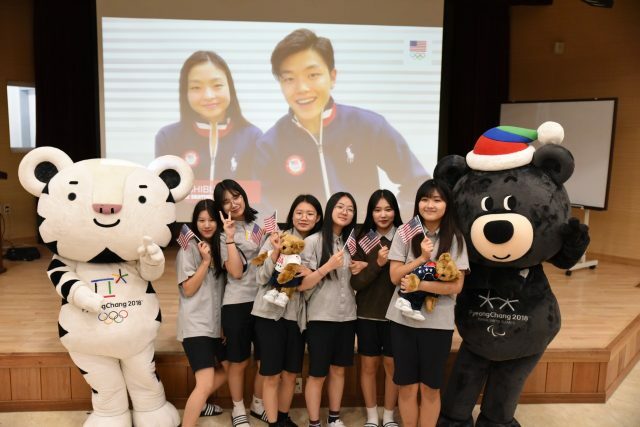 The United States Olympic Committee (USOC) has launched a Korean youth mentorship program in partnership with the Pyeongchang 2018 Organizing Committee and Jinbu Middle School. It is part of the USOC’s “Thank you, Pyeongchang” initiative, a goodwill campaign aimed at contributing to the legacy of Pyeongchang 2018 and making an impact on the global community through the spirit of Olympism. Three-time World Championship medalists and Sochi 2014 Olympic figure skaters Maia and Alex Shibutani will mentor students of Jinbu Middle School through virtual lessons leading up to the Games, culminating in an on-site visit with students in February. In turn, Jinbu Middle School students will teach the Shibutanis, a brother-and-sister duo, about South Korean culture and what athletes and supporters can expect when the Pyeongchang 2018 Olympics begin on February 9. Things that the students share will be incorporated into the Team USA Ambassador Program, which is made up of athlete training sessions that all members of the US’s 2018 Olympic and Paralympic team will attend prior to the Games. “Maia and Alex personify the spirit of the Olympic Movement and are excellent ambassadors to represent Team USA in this youth mentorship exchange with the students of Jinbu Middle School,” USOC chief executive Scott Blackmun said. “We are grateful for the partnership of the Pyeongchang Organizing Committee’s education team in facilitating this connection with the school. Starting in September, the Shibutanis will host a series of monthly mentorship sessions with students via video chat. “We are so excited to be mentors to students who could be the next generation of Olympians in Korea,” Alex Shibutani said. “We’re very passionate about the Olympic Movement and the Olympic values, and we believe in their power to inspire and unite younger generations throughout the world. To assist with the delivery of the program, the Pyeongchang 2018 education team will be providing support, including the facilitation and coordination of the video chat sessions. They will also provide guidance on the lesson plans and promote the mentor program across all relevant education channels locally. “The USOC’s initiative around mentorship of local students is a wonderful addition to the work we are doing with schools across the country in the lead up to the Games,” Pyeongchang 2018 President Lee Hee-Beom said. To begin the program, the Shibutanis released a video for the students today – the first day of the 2017-18 school year – expressing their excitement to teach them about topics such as the Olympic values, health and nutrition, and what it takes to be Olympians, as well as to learn about Korean culture as they prepare to compete in the host country. “To be able to learn about Korean culture and connect with the children of Pyeongchang is very special,” Maia Shibutani said. Jinbu Middle School is a historic establishment located in the heart of the Olympic action. Founded in 1952, the public middle school currently has 214 students enrolled, ranging in age from 13 to 15. The Shibutanis are often referred to as the “Shib Sibs”. They have medaled at the US Figure Skating Championships for 13 consecutive years, at every level they have competed.